Who Benefits from California’s EITC? The State of California’s Franchise Tax Board (FTB) recently released a report on the impact of the state’s earned income tax credit (CalEITC). Using data from Tax Year 2015, the FTB found that the CalEITC benefitted approximately 815,000 Californians and together with the federal credit, helped lift approximately 250,000 Californians out of deep poverty. 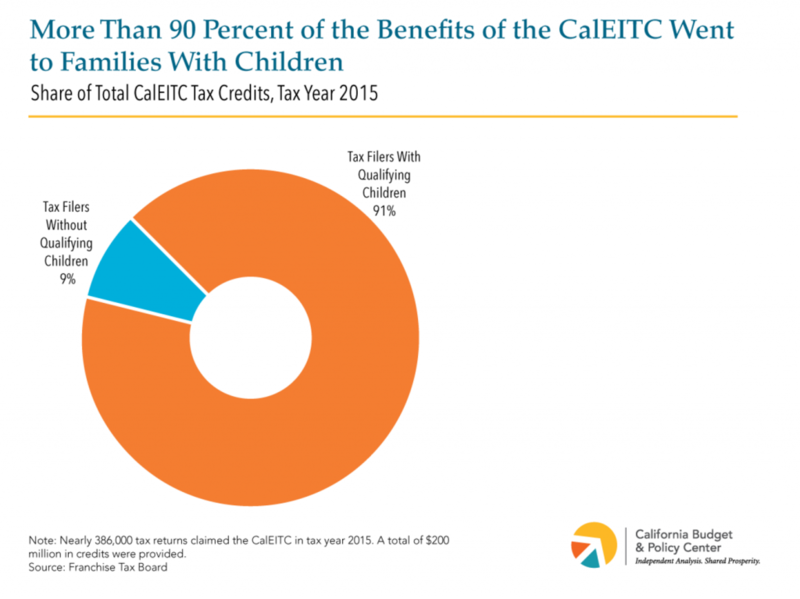 The report also noted that families with children received 91 percent of the $200 million in credits in 2015 while only nine percent of the credits went to taxpayers without qualifying children, though this population represents almost half (44 percent) of all CalEITC claims. Read more about the report and the current proposals to expand the state credit by taking a look at this California Budget and Policy Center blog post.